Here at the Bay View Resort, we offer oceanfront fun, Myrtle Beach Boardwalk excitement and miles of white sandy beaches at your fingertips. But, since we can't control the weather and sometimes it will rain, there is no need to worry, we have everything you need to keep that vacation fun going even if it is wet outside. Hollywood Wax Museum — Located at Myrtle Beach shopping/dining/entertainment hot spot Broadway at the Beach (and an easy, 7-minute drive from Caribbean Resort & Villas), this attraction lets you get up close and personal with some of the silver screen’s biggest stars — or their amazing likenesses, anyway. Other make-you-look-twice humanlike wax figures include musical icons, top sports figures, royalty and more, all perfect for selfie-taking. While you’re there, check out Hannah’s Maze of Mirrors and the Outbreak experience. Learn more at hollywoodwaxmyrtlebeach.com. Rockin’ Jump — Found about 3 minutes south of Caribbean Resort & Villas on North Oak Street, this trampoline park is a perfect destination for those looking to burn off some energy indoors. Attractions such as the Vertical Ops rock-climbing wall, the Ninja Challenge obstacle course, the Slam Dunk Zone basketball court and the X-Beam jousting pit will have the youngsters in your crew bouncing off the walls. Other fun areas include the air-filled Stunt Bag for safe flipping and jumping, as well as the Dodgeball Arena and the Open Jump Arena. An on-site pizza parlor allows visitors to grab a bite to eat when they’re not jumping for joy. Visit rockinjump.com to learn more. Ripley's Aquarium — Also located at Broadway at the Beach, this attraction lets visitors see the creatures of the ocean’s deepest depths, all while staying dry and at sea level. Get an up-close look at sharks, stingrays (which you can even touch), fish of the Indo-Pacific coral reef (including triggerfish, tang, rabbitfish, clownfish, angelfish and more), eels, tarpon, sea turtles, puffer fish, horseshoe crabs, sea dragons, octopuses, jellyfish — the list is practically as long as the ocean is deep. Learn more at ripleyaquariums.com. 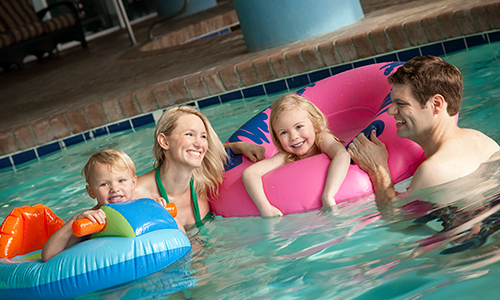 Bay View Resort – We have indoor pools, lazy river and games for all to enjoy. Maybe want to curl up and watch a movie, you can use your unlimited DVD rentals located in the lobby. Rain or shine, there are plenty of ways to make memories on our stretch of the Carolina coast!